We now unfold diversity in the eldership following the same overall outline we used to develop parity. We first establish the Biblical Concept of diversity; second, we expound its Manifold Substance; and third, we apply some of its Practical Implications. 1 Tim. 5:17 – Let the elders that rule well be counted worthy of double honor, especially those who labor in the word and in teaching. Rom. 12:6-8 – And having gifts differing according to the grace that was given to us, whether prophecy, let us prophesy according to the measure of our faith; or of ministry, let us give ourselves to our ministry; or he that teaches, to his teaching; or he that exhorts, to his exhorting: he that gives, let him do it with liberality; he that rules, with diligence; he that shows mercy, with cheerfulness. 1 Cor. 12:28,31 – And God has set some in the church, first apostles, secondly prophets, thirdly teachers, then miracles, then gifts of healing, helps, governments, diverse kinds of tongues … But desire earnestly the greater gifts. 1 Pet. 4:10,11 – According as each man has received a gift, ministering it among yourselves as good stewards of the manifold grace of God; if any man speaks, speaking as it were oracles of God; if any man ministers, ministering as of the strength which God supplies: that in all things God may be glorified through Jesus Christ. The warrant for diversity in the eldership rests on the shoulders of a few texts. Yet these texts are mighty men, able to carry the weight convincingly to the conscience. First among them is 1 Tim. 5:17. Here Paul explicitly requires diversity of valuation and honor, “let the elders that rule well be counted worthy of double honor.” Some elders in virtue of grace and experience have a good track record. Since they rule with sustained proficiency and skill, they deserve special respect and appreciation from God’s people. Herein lies the first type of diversity in the eldership. Yet, in this same text, Paul implicitly discloses a far deeper diversity, one which touches the very form and structure of the eldership, “those who labor in the word and in teaching.” Some elders, not all elders, labor in the Word as their calling. Whereas some elders spend their day laboring at farming, engineering, carpentry, medicine, or law, other elders labor full-time in the study, exposition, and proclamation of the Scriptures. All elders have the same office, rank, and authority. They all belong to the same ruling body of church officers. Yet all do not have the same ministerial vocation or career. Only some are preachers, or ministers of the Word, while the rest labor in various mundane callings. What is the basis for this diversity of vocation? Why do only some of the elders labor in the Word as their life’s occupation? Although this text does not answer, three other texts rush to offer their support (Rom. 12:6-8; 1 Cor. 12:28,30; 1 Pet. 4:10,11). These passages describe a rich diversity of spiritual gifts among the people of God. Although some of these gifts were temporary, passing away with the apostles, others remain until Jesus comes. The Lord, in his grace, continually showers upon his church militant a rich supply of ability to teach, to exhort, to give, to rule, to show mercy (Rom. 12:6-8), to help, and to counsel (1 Cor. 12:28). Herein lies the explanation for diversity of vocation in the eldership. Some elders, but not all elders, are so gifted to teach and preach that they should be set apart to labor in the Word of God as their life’s work. These must be recognized by the church and supported as ministers of the gospel, who give themselves to prayer and the ministry of the Word (Acts 6:4). Thus, Scripture teaches that the eldership displays a diversity of vocation, of proficiency, and of giftedness. Having established the biblical concept, we now unfold its threefold substance. We begin with diversity of vocation, then take up diversity in proficiency, and conclude with diversity of giftedness. Acts 6:4 – But we will continue steadfastly in prayer, and in the ministry of the word. Acts 13:1 – Now there were at Antioch, in the church that was there, prophets and teachers. Rom. 12:6-8…. whether prophecy, let us prophesy according to the measure of our faith; or of ministry, let us give ourselves to our ministry; or he that teaches, to his teaching; or he that exhorts, to his exhorting. 1 Cor. 12:28 – And God has set some in the church, first apostles, secondly prophets, thirdly teachers. Gal. 6:6 – But let him that is taught in the word communicate unto him that teaches in all good things. Eph. 4:11 – And he gave some, to be apostles; and some, prophets; and some, evangelists; and some pastors and teachers. 1 Tim. 4:6 – If you put the brethren in mind of these things, you shall be a good minister of Jesus Christ. 2 Tim. 3:16,17 – Every Scripture is inspired of God … that the man of God may be complete. 2 Tim. 4:5 – do the work of an evangelist, fulfill your ministry. 1 Pet. 4:11 – if any man speaks, speaking as it were oracles of God. These texts epitomize the biblical testimony. Proceeding with caution, we recognize that some things said of the apostolic generation of ministers, with its apostles, prophets, and evangelists, do not pertain to the pastor-teachers who abide in every generation. With this warning in mind, we observe that in reference to the permanent preaching vocation, these texts address three key questions: What is this vocation called? How should this vocation be conferred and maintained? What are the essential duties and aims of this vocation? We now take up each of those basic questions and issues. Since Scripture speaks directly about these designations, we should not be careless with them. Yet, since the Bible shows considerable flexibility, neither should we be hyper-dogmatic about them. For example, some may prefer at times to denominate elders who labor in preaching as “pastors.” This could be valuable to underscore that pastoral office regulates the design and manner of the teaching vocation. Even the 1689 London Confession, in 26:10, seems to use the term “pastor” this way, “The work of pastors being constantly to attend the service of Christ, in His churches, in the ministry of the Word and prayer … it is incumbent upon the churches to whom they minister, not only to give them all due respect, but also to communicate to them of all their good things.” Here our Confession defines the work of gospel ministers and enjoins financial remuneration for them. Yet, while speaking about their work, our Baptist fathers denominate them, not in terms of their work, but in terms of their office, as “pastors.” Is this communion of idioms inexcusable? I think not, even if men seize upon it for their own ends. I must concede that their choice of words is liable to abuse. Indeed, since it could obscure the fact that all elders are pastors and bishops of the flock, some do twist this very use of the term “pastor” to support their own view that some elders are not pastors. Search and see that our Confession in 26:11 equates bishop and pastor as synonyms to denominate the ruling office, and in 26:8,9 bishop and elder. Should we conclude that our Baptist fathers were careless about terms? Not at all. As Pastor Waldron proves so convincingly in Chapter 6, the framers of our Confession were not oblivious to the legitimate implications of their terms. Thus, they carefully revised some of the terms used in the Savoy Platform of Polity. They deliberately chose designations which would distance our Confession from the “four office” view. The Savoy Platform, Paragraph 13, says, “although it be incumbent upon the pastors and teachers of the churches to be instant in preaching the word by way of office” (26:11). The Baptist fathers changed it to, “although it be incumbent on the bishops or pastors of the churches to be instant in preaching the Word by way of office.” They changed “teacher” to “bishop”, because, in terms of his office, the pastor laboring in the Word is a bishop, not a teacher. In this our Baptist fathers serve as a good model. They were careful about terms, but not overly scrupulous. How shall we apply all this to those elders who do not labor in the Word? How shall we designate them so as to distinguish them from gospel ministers? Again, since Scripture binds us not, we must not bind others. Again, since any designation we employ has both strengths and liabilities, we must avoid being either overly dogmatic or oblivious. We could call them “lay elders”, since in office they are elders, though in their vocations they are laymen, not clergymen. This could be valuable to underscore that Christ conveys the highest office in His church, not only to the clergy, but even to “laymen”, who work for a living as carpenters and fishermen. It could give clericalism a much needed slap in its arrogant face. Yet, this choice of terms could backfire on us. It could promote the invalid distinction between clergy and laity practiced by Rome. It could obscure the fact that these elders, just as truly as the preachers, are ordained bishops or pastors, equally possessing all the rights and prerogatives of ordination. Again, we could call them “ruling elders “, and call preachers, “teaching elders.” This could be valuable to underscore that Christ’s church has but one ruling office, that of elder. It could provide added benefit since it identifies the chief distinctive of the pastoral office, “ruling”, with those who hold merely the office, and the prime distinctive of the pastoral vocation, “teaching”, with those who have both the office and the vocation. Yet, this is not without liability. It involves redundancy, since there is no such thing as a non-ruling elder. More importantly, it could obscure the fact that the pastoral office always has a teaching, not merely a ruling function, and that even ruling elders must be able to teach and exhort. Again, we could call them “non­supported elders “, and call preachers, “supported elders.” This too could be valuable to underscore parity of office. This nomenclature could also be beneficial because it identifies the primary way, financial support, in which the church’s duty to her preachers differs from her duty to her other pastors. Yet it is not without liability. Since it points to no reason for financially supporting only some elders, it could obscure the propriety and basis for the very vocational distinction it purports to uphold. Thus, it could open the door for two extremes. It could encourage, on the one hand, a “no-preacher” view of the eldership, with the pastoral vocation eliminated, with all elders preaching part-time and receiving partial support; or on the other hand, an “all-preacher” view of the eldership, with non-vocational elders eliminated, with all elders preaching full-time and receiving full-support. What then, should we just give up? I say not that we should give up altogether, but rather that we should all together give up regarding our brethren as offenders merely on account of their choice of terms. We all tend to prefer terms designed to counter evils which we regard as the most pressing or dangerous. Sadly, this oft grows out of bad church experiences. We may have seen ambitious elders, lacking greatly in preaching gift and love for the sheep, harass and criticize a godly preacher almost to madness because they coveted the pulpit for themselves. Then we may press for what amounts to a “three office” view. We may insist that we call only preachers, “pastor”, refuse ever to submit to ruling elders, or totally banish ruling elders from the pulpit. On the other hand, we may have seen preachers who love pre-eminence browbeat good but timid elders almost into lackeys and yes-men. Then we may press for what nearly amounts to full-blown Brethrenism. We may insist on equality in every respect among the elders, even to the point of requiring that elders equally share the pulpit and the chairing of meetings. Yet, brethren, carnal ambition always threatens both elder and preacher. Though our choice of terms can neither prevent nor cure it, yet it can assist in fostering biblical thinking. Thus, we prefer to speak of “vocational pastors”, who labor in the Word, and “non-vocational pastors “, who hold the office of pastor, but labor in mundane vocations. Yet, since no single set of terms can ever prove totally adequate, I prefer to use more than one, and explain what I mean by each. Combining terms may be useful at times. For example, we could call all the elders, “pastors”, and those elders who labor in preaching and teaching, “pastor-preachers”, and “pastor-teachers.” I also suggest that to counteract episcopal tendencies, it could help to call all the elders, “bishop “, occasionally, and even to speak of “lay bishops”, with mundane occupations. How should a man enter this vocation? First, no man dare take it upon himself. God calls men out of their mundane occupations to be preachers. Christ gives such men as gifts to His church (Eph. 4:9-11). God’s people, both leaders and congregation, should recognize Christ’s gift. 1 Tim. 4:14 and 2 Tim. 2:2 teach that elders and preachers should play a prominent role in calling a man to this vocation. Acts 15:40 and Gal. 6:6 teach that the whole church should recognize and support those whom Christ fits to be preachers. Since the pastors, with the whole church, recognize that Christ has called a man to this work, it is incumbent upon the church to provide financially for each man they set apart to labor as a minister of the Word (1 Cor. 9:6-14; Gal. 6:6; 1 Tim. 5:17,18). The 1689 Confession (26:10) clearly affirms the church’s duty to provide a comfortable supply for her pastor-preachers. Peter epitomizes a minister’s labor, “But we will continue steadfastly in prayer, and in the ministry of the word” (Acts 6:4). These few words comprehend a preacher’s duties and functions. Prayer is the foundation of all godly preaching and teaching. When a pastor-preacher prays over his flock and sermons, he does his first work. A prayerless minister builds without a foundation. He labors in the flesh, not in dependence on the Spirit and strength which God supplies. The focus and hub of this work is God’s Word. A pastor-teacher’s manifold duties all revolve around it. The ministry of the Word, like a great tree, has many branches, each branch with its own object, focus, and design. This labor focuses on God Himself, on Christ’s church, His flock, on reaching lost men with the gospel, on faithful men, able to teach others, and on the Bible itself. First, the ministry of the Word focuses on God Himself. In one sense, God Himself is its object (Acts 13:1,2). In this respect, a gospel minister acts as a man of God. He designs to make God’s will, revealed in Scripture, known to all who hear him. He speaks to men, not for himself, but for God. When he thus speaks in God’s name, he speaks to men exhortation, admonition, consolation, and confirmation (Acts 15:32; 1 Cor. 14:3). This often occurs in corporate worship, when God meets with His people, and speaks to them through the teaching and preaching of His Word. In this way a preacher especially represents the Lord. I must qualify this. I do not mean that prophets are present in the church today. Nor do I mean that gospel ministers receive direct revelation from God, or speak infallibly for Him. Nevertheless, preaching bears some resemblance to prophetic ministry, yet only to the extent that men, sent from God, preach and teach the Lord’s mind to those who hear (Rom. 10:14,15). Second, the ministry of the Word focuses on the church, Christ’s flock of sheep. In this sense its object is the temple of God, Christ’s disciples, viewed both individually and corporately (I Cor. 3:16,17; 6:19). In this connection, the minister of the Word acts as a pastor of his flock. He aims to present every man complete in Christ (Eph. 4:11-16; Col. 1:28; 2 Tim. 4:1,2) and to order the church in all its ways according to the will of Christ and the apostles (1 Tim. 4:6). Third, the ministry of the Word focuses on reaching lost men with the gospel. In this sense its dual object is lost men and God’s gospel. Here, a gospel minister does the work of an evangelist (2 Tim. 4:5). He designs so to proclaim the gospel as to make it without charge, to saint and sinner alike. He also designs the eternal good of all lost men who hear him. Again, I qualify this. I do not mean to say that evangelists are present in the church today, as they were in the apostolic generation. I mean only that in this respect gospel preaching bears resemblance to their work. Fourth, the ministry of the Word focuses on faithful men, able to teach others. In this sense its object is men suited for and engaged in the Christian ministry (2 Tim. 2:2). Here a gospel minister acts as a teacher. He designs both to train faithful men for the ministerial vocation and to aid his fellow ministers. Fifth, and finally the ministry of the Word focuses on the Bible itself. Here its object is the Scriptures, the Word of God written. In this respect a gospel minister acts as a scribe (Rom. 16:22). He designs both to preserve the inspired text and to translate it into the native language of his hearers (Neh. 8:1,4,8). He also designs to read the Scriptures publicly, in the language of his hearers, so that they can both hear and understand them (Neh. 8:8; I Tim. 4:13; Rev. 1:3). Evidently, no gospel minister can do all this single-handedly. In the church, God has so designed ministerial work that pastor-preachers must cooperate, each doing part of the work, all laboring together as a team for the glory of God and the good of their fellow men (1 Cor. 3:4-7, 12:28). Thus, each minister of the Word must strive with humility and integrity to discern and do his small part of this great work, and to rejoice in that labor which God has entrusted to his brethren (Rom. 12:3). Let the elders that rule well be counted worthy of double honor, especially those who labor in the word and in teaching (I Tim. 5:17). Paul calls us to show special respect for good leaders, who rule God’s people proficiently. Here observe, first, the objects of special honor, “the elders who rule well … especially those who labor in the word and teaching”, second, the mandate for special respect, “Let … be counted worthy”, and third, the display of special appreciation, “double honor.” We now take up each of these briefly. 1. Consider the objects of special respect and appreciation. Not all elders are to be objects of special respect, but those “who rule well.” Paul uses the Greek verb, προιστημι (proistemi), which means “to rule over”, or “to care for.” This same verb occurs in Rom. 12:8, “he that rules, with diligence”, and in 1 Thess. 5:12, “who are over you in the Lord and admonish you.” In Titus 3:8, 14, where the ASV translates it “to maintain”, it means “to be concerned about.” In 1 Tim.3:4, 12, it means to direct or manage a household. In 1 Tim. 3:4, 5 Paul uses another verb, επιμελεομαι (epimelomai), translated “take care of”, in parallel with προιστημι as a synonym. In Luke 10:34, 35 επιμελεομαι describes the Samaritan’s care for the wounded man. The Samaritan himself uses this verb when he charges the innkeeper to “take care of” him. The parallel sheds light on this use of προιστημι. The rule of elders, like parental oversight, combines management and care. Provision for needs joins enforcement of rules. Parents should make decisions and policies with the best interest of the family in mind. So too, elders should manage considerately, with the people’s good in mind. Paul adds the adverb καλος (kalos), translated, “well.” What is the opposite of ruling well? Not ruling poorly or inadequately, for such men would not be qualified to hold the office at all. Paul speaks in comparative terms. Though all men qualified to be elders rule with a modicum of competence, some elders rule with marked proficiency. Paul refers to these. This comparative excellence in ruling stems from a number of factors, such as measure of gift, of grace, and of experience. Scripture also delineates the primary marks of proficient rule. First, ruling well involves ruling firmly. A parent ruling his household well has his “children in subjection with all gravity” (1 Tim. 3:4). When parents rule well, they run a “tight ship.” Children show respect and take directives seriously. Parents expect and enforce submission. Similarly, when elders rule well, church members show them a respect which they have earned and maintain. Proficient rulers are neither irresolute nor spineless. Second, ruling well means ruling diligently. Rom. 12:8 teaches that men should rule “with diligence.” According to 1 Tim. 4:15, one mark of diligence is evident improvement. Another mark is the prosperity it often brings (Prov. 21:5). Again, diligence, as a general rule, brings honor, not shame (2 Tim. 2:15). Again, a man diligent in his business usually obtains credibility (Prov. 22:29). Further, swift and earnest responses, not procrastination and insincerity, mark diligence. The word, σπουδη (spoude), translated “diligence” in Rom. 12:8, means to act swiftly out of genuine concern. In Rom.12:11 it is contrasted with being slothful or lazy. In Mark 6:25 and Luke 1:39 it is translated “haste.” In 2 Cor. 7:11,12 Paul cites the Corinthians’ zealous response as evidence of their diligence. Thus, diligent elders respond swiftly and sincerely. They usually obtain a good reputation among the churches. A flourishing church, blessed of God, indicates that its elders rule diligently. Third, ruling well involves ruling compassionately. It means truly caring about those you manage (1 Tim. 3:5; Titus 3:8,14). This involves giving them individual attention, feeling compassion for them, and showing genuine concern for their souls (1 Thess. 5:12). Ruling well takes place, not from an ivory tower, but in close interaction and personal care. Elders who remain aloof from Christ’s sheep, or who have no heart for them, can never rule well. To sum up: How can you spot elders who rule well? Though all qualified elders rule with some degree of firmness, diligence, and compassion, proficient elders display these qualities in great measure. Thus, they run a tight ship. They respond promptly and sincerely. The church is improving and prospering. There is no cause for embarrassment. They truly care about their people. Paul also adds the phrase, “especially those who labor in the word and in teaching.” He begins with the Greek word, μαλιστα (malista), translated “especially.” This word limits ideas. Bauer, Arndt and Gingrich offer as plausible translations, “most of all”, “above all”, “especially”, and “particularly.” The word conveys emphasis or primacy (Acts 20:38; 2 Pet. 2:10). Most render it, “primarily”, “especially”, or “chiefly.” Thus, Paul here identifies his special focus of concern. He has preachers who rule well primarily in mind. 2. Consider the mandate for special respect and appreciation. Paul does not suggest special honor but requires it, “let … be counted worthy.” The word, αχιοω (axioo), translated “counted worthy of”, is rarely used in the New Testament (Luke 7:7; Acts 15:38; 28:22; 2 Thess. 1:11; 1 Tim. 5:17; Heb. 3:3; 10:29). It means “to deserve”, “to be entitled to”, whether reward (1 Tim. 5:18), or punishment (Heb. 10:29). Thus, Paul means that we are obliged to think that proficient elders, chiefly preachers, are entitled to double honor. Failure to bestow that double honor would rob them of their due. It therefore behooves us to study carefully what this involves. 3. Consider the display of special respect and appreciation. What does “double honor” mean? The Greek word τιμη (time), “honor”, has two related uses. First, it describes the respect, credit, or praise which virtue deserves and elicits (Rev. 4:11). Second, it describes the price or value of something (Matt. 27:6,9; Acts 4:34; 5:2,3; 7:16). Bauer, Arndt, and Gingrich also observe these two uses of the word. They offer the translations, “honor”, or “reverence”, for the first use; and “price”, or “value”, for the second. 1 Pet. 2:7 displays the connection between these uses. The NKJV renders it, “to you who believe, he is precious.” It could literally be translated, “to you who believe, the honor.” It means that Christ is very valuable to believers. Price is oft the measure of the value people place on something. When men honor someone, they regard him as valuable, precious, of great price. Thus, Paul enters the orbit of valuation. Elders who rule well, chiefly preachers, should be considered “doubly valuable.” The Greek word διπλη (diple), “double”, means “twofold” or “twice.” Metaphorically, it expresses emphasis (Matt. 23:15; Rev. 8:6). Thus, commentators interpret “double honor” various ways. Calvin says, “I have no objection to Chrysostom’s interpretation of `double honor’ as meaning support and reverence, and anyone who wishes may follow him. But it seems more likely that there is a comparison here between presbyters and widows.” Hendriksen lists five views: (1) both salary and respect, (2) twice their current salary, (3) twice the salary of widows, (4) respect as brothers and as rulers, and (5) respect both as elders and as elders who rule well. What shall we say? Though Calvin’s view captures an element of truth, the fifth view, in my judgment, epitomizes Paul’s main point. Remembering his chief concern should keep us on the right trail. All elders are very valuable to the church, and she should highly esteem them (1 Thess. 5:12), but elders doing a good job are doubly valuable, that is, emphatically more valuable, and she should increase dramatically her esteem for them. This primarily applies to her vocational pastors, her preachers. How then should the church express her heightened esteem for preachers who rule proficiently? In 1 Tim. 5:18 Paul enforces this command, “For the Scripture says, You shall not muzzle the ox when he treads out the corn. And, The laborer is worthy of his hire.” Two considerations strongly indicate that the special honor due to proficient preachers includes financial remuneration. These are the support Paul cites and the terms he employs. The terms “labor” and “hire” belong in the orbit of salary paid for work. In 1 Cor. 9:8-12 Paul appeals to these same texts to support his teaching that those who work as gospel preachers have a right to earn a living from that work. In 1 Cor. 9:14 he merely alludes to Christ’s polity of financial compensation, here he cites it explicitly (Luke 10:7). Thus, if Paul intends only increased respect, the scriptural support he cites is misleading at best. Nevertheless, commentators differ about this. Calvin argues for including financial remuneration, “to return to Paul, he orders that a livelihood be provided especially for the pastors who are engaged in teaching.” Hendriksen agrees, “this double honor must not be so interpreted as if any idea of remuneration is completely excluded from it … Paul is emphasizing that the respect of which excellently ruling elders are worthy implies that those among them who devote themselves entirely to gospel-work have a right to wages, and that these wages should not be withheld.” Lenski, however, disagrees, “It is generally assumed that the elders were paid for their services in the apostolic churches. We are convinced that this assumption is not tenable. 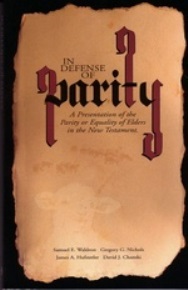 The probability is that none of them were paid.” He then tries to explain how Paul, though he didn’t have salary in mind, could cite such texts, “the analogy lies in the worthiness and not in the identity of what the three are worthy of: the elders worthy of what naturally should go with their office-honor; the ox worthy of what naturally goes with the task for which he is employed-wisps of grain; the workman worthy of what naturally goes with his work-pay for his work.” Lenski, ironically, clearly points to why financial remuneration can not be excluded. Paul primarily has workers in mind, vocational pastors. A worker is worthy of what goes naturally with his work-pay for his work. The fact that even the ox is worthy of grain teaches that preachers have a right to receive salary for their labor (1 Cor. 9:6-14). Therefore, the special appreciation due to proficient preachers includes financial remuneration. All vocational pastors deserve both the respect arising from their office and the salary due for their work. The ones who rule well, being doubly valuable, should receive far more respect and salary. This displays that the church values them, not only as pastors and workers, but as good pastors and good preachers. How does this apply practically? Although Paul does not spell out the exact situation he writes to correct, the context, as Calvin says, provides a strong clue. When he sets church policy for widows in 1 Tim. 5:3-16, he corrects misplaced priorities in the use of church funds. The church should care for “widows indeed”, but not “be burdened” if Christian family members can relieve them (1 Tim. 5:3,4,16). Similarly, and more so, it should provide with right priorities for good preachers. It should not force such to work two jobs, while it sends funds elsewhere. Rather, it should honor them, not with a widow’s subsistence, but with a far better living. This also implies that compensation for preachers should be related to the quality of their work. Though proven preachers should receive more salary, Paul implies, not ten-fold increase, but a modest raise. This deters greed and idolizing very gifted men. What then of other elders who rule well, proficient lay bishops? Paul’s directive also applies to them. As Lenski says, they deserve what goes naturally with their office, respect and appreciation. When they discharge their office well, they deserve emphatically more respect and appreciation. Further, if their proficiency stems from a larger measure of gift to preach, they should, in due time, be fully supported to preach as a vocational pastor. If they display a superior ability to manage, they might in a larger church even be fully supported to labor in oversight. Further, at times special tokens of esteem for proficient rule may be proper. For example, a non-vocational elder who for many years faithfully visits his flock may be given a new car as a token of special appreciation. Churches have many other options, as limitless as love can invent, and as manifold as need may require. Christ gives his church a vast number of men endowed with a wide assortment of ministerial gifts (Rom. 12:6-8; 1 Cor. 12:28-31; Eph. 4:9-11; 1 Tim. 4:13,14). He bestows this rich deposit to further his glory and kingdom (1 Pet. 4:10,11). We consider three things about these gifts: (1) What they are; (2) How they are discerned and recognized; and (3) How and when they should be exercised and employed. According to one interpretation we have here two distinct offices-that of pastor and that of teacher. ‘The latter,’ says Calvin, ‘had nothing to do with discipline, nor with the administration of the sacraments, nor with the admonitions or exhortations, but simply with the interpretation of Scripture’ (Institutes IV, 3,4). All this is inferred from the meaning of the word teacher. There is no evidence from Scripture that there was a set of men authorized to teach but not authorized to exhort. The thing is well nigh impossible. The one function includes the other. The man who teaches duty and the grounds of it, does at the same time admonish and exhort. It was however on the ground of this unnatural interpretation that the Westminster Directory made teachers a distinct and permanent class of jure divino officers in the church. The Puritans in New England endeavored to reduce the theory to practice, and appointed doctors as distinct from preachers. But the attempt proved to be a failure. The two functions could not be kept separate. The whole theory rested on a false interpretation of Scripture. The absence of the article before διδασκαλου proves that the apostle intended to designate the same persons as at once pastors and teachers. Thus, Paul views the body of elders, with its parity and diversity, as Christ’s gift to His church, “some pastors and teachers.” Christ gives His church each man, and all the men, whom God puts into the office of pastor or bishop, and calls into the vocation of preacher or teacher. In specific terms, a ministerial gift is a God-given capacity or ability to perform some aspect of the Lord’s work for His glory and men’s good. Scripture delineates various pastoral gifts. Some gifts relate mainly to the ruling office, some primarily to the preaching vocation. In Rom. 12:6-8, the ability to teach (12:7) and to exhort (12:8) relate mainly, though not exclusively, to the preaching vocation. The ability to manage or govern (12:8), relates chiefly, though not only, to the ruling office. In 1 Cor. 12:28-31 Paul first lists three ministerial vocations which God placed in the church, apostles, prophets, and teachers. Apostles and prophets were restricted to the founding of the church (Eph. 2:20). Teachers are permanent, set by God in the church in every generation. I take it that Paul refers mainly to official teachers, elders who labor in the Word, whom he denominates in terms of their vocation. Yet I concede that the phrase may encompass, not only preachers, but, in Hodge’s words, all “uninspired men who had received the gift of teaching.” He next enumerates sundry abilities with which God endows some in the church. Gifts of miracles, healings, and tongues were apostolic. Gifts of helps and governments, or counsels, are permanent. As the gift of helps especially relates to the diaconate, the serving office, so the gift of wise counsels especially, though not exclusively, pertains to the eldership, the ruling office. In 1 Tim. 4:13, 14 Paul exhorts Timothy to give himself to reading, exhortation, and teaching. He then exhorts him diligently to nurture the ministerial endowment God gave him, and urges him wholeheartedly to pursue the closely related commission to which the elders ordained him. Thus, God enables men to read, preach, and teach the Bible in an edifying manner. As good stewards, men should cultivate their ministerial gifts so as to attain maximum usefulness. In 1 Pet. 4:10, 11 Peter also includes ability to speak God’s Word as an endowment received as a stewardship from the Lord. God conveys these gifts with a view, not to men burying them, but using them for His glory. Just as both the members and the elders must discern a call to labor in the Word, so also must they recognize ministerial gifts. Paul assumes the Corinthians could discern such gifts among themselves (1 Cor. 12:28-31). He reminds Timothy that the elders confirmed his gifts when they commissioned him (1 Tim. 4:14). The discernment of gift in others and in ourselves requires humility and grace (Rom. 12:3). Too commonly, we tend to desire for ourselves the greatest gifts, and to think ourselves endowed more greatly than in reality we are. Pride, jealousy, and envy pose major obstacles to an accurate assessment both of our own gifts and of the gifts of others. At times God’s people may disagree respecting the ministerial gifts deposited in their midst (1 Cor. 3:4-9). In such a case, schism can result and do great harm to the testimony of religion and the good name of the church. As Paul did, we must labor also to avoid such divisions. At times men feel a need to promote themselves and their gift, sometimes to the detriment of others, and sometimes even against the counsel of the churches. Such things ought not to be. If God has given a gift, he will also make room for it to be exercised, and will cause His people to recognize it. If we think ourselves so endowed, we need grace to wait on the Lord, “for not he who commends himself is approved, but whom the Lord commends” (2 Cor. 10:13-18). Three major factors regulate the use of gifts: (1) their measure (Rom. 12:6-8), (2) edification (1 Cor. 14:12,26), and (3) stewardship (1 Pet. 4:10). First, the measure of gift and faith must regulate the use of gifts. For this cause, in all probability, Paul, rather than Barnabas, was the chief speaker on their first missionary journey (Acts 14:12). Second, the edification of God’s people must regulate the use of gifts. Decisions about the length of messages, the best man to speak on a given topic, and many similar issues should be made on the grounds of edification (1 Cor. 14:12,17,26). Third, stewardship of God’s endowment must regulate the use of gifts. God gave the gifts to be used. If the door of opportunity closes in one place, God by this means may be directing His servants to employ their gifts elsewhere, rather than neglect them (Acts 16:6-10; 1 Pet. 4:10). Each Christian man endowed with ministerial gift must strive to discern and fulfill that ministry which Christ has given him. He must do so in the fear of God, and in consultation with gospel ministers, the eldership, and the whole church. Similarly, each gospel minister must labor to discern how much of his time and energy he should give to any branch of labor in the Word. This is neither a simple nor static issue. May God grant us all grace and wisdom to labor for His glory in a manner and sphere most conducive to edification and peace. We close with a word of application. We summarize and enlarge some of the primary ways in which a biblical eldership may display diversity. Consider with me seven practical implications of diversity of vocation, honor and gift in the eldership. 1. Diversity implies that some elders may have a larger share of the pulpit or lectern. Diversity of calling and gift imply this. Elders not called to preach or to teach as a vocation should not share the preaching and teaching equally with those who are. Further, in virtue of differing gift, not even all the ministers of the Word should necessarily share the pulpit or lectern equally. In some settings, one may be the chief speaker (Acts 14:12). Edification, balanced with stewardship of gift, should determine the frequency with which each minister preaches in the pulpit or teaches from the lectern. 2. Diversity implies that some elders may take a larger share of visiting and counseling. Some elders may have a greater gift for giving wise counsels in the private ministry of the Word, or in visiting the sick. The congregation may gravitate naturally to them for counsel with knotty personal, emotional, and domestic problems. Others may, in virtue of heavier teaching duties, be directed by the eldership to carry a reduced workload in visitation and counseling. 3. Diversity implies that some elders may have a higher profile in church administration. I do acknowledge that where a church is greatly increased, so as that there is a necessity of many elders in it for its instruction and rule, decency and order do require that one of them do, in the management of all church-affairs, preside, to guide and direct the way and manner thereof: so the presbyters at Alexandria did choose one from among themselves that should have the pre-eminence of a president among them. Whether the person that is so to preside be directed unto by being the first converted, or first ordained, or on the account of age, or of gifts and abilities, whether he continue for a season only, and then another be deputed unto the same work, or for his life, are things in themselves indifferent, to be determined according to the general rules of reason and order, with respect unto the edification of the church …I shall never oppose this order, but rather desire to see it in practice,-namely, that particular churches were of such an extent to require many elders, both teaching and ruling … and that among these elders one should be chosen by themselves, with the consent of the church, not into a new order, not into a degree of authority above his brethren, but only unto his part of the common work in a peculiar manner, which requires some kind of precedency. Hereby no new officer, no new order of officers, no new degree of authority, is constituted in the church; only the work and duty of it is cast into such an order as the very light of nature doth require. 4. Diversity implies that some elders may have a wider influence or recognition. This is implied by diversity of valuation and honor (1 Tim. 5:17). Some lay bishops with vast experience, and ministers with larger gifts, will attain greater influence than other elders. This is true, not only in their own local churches, but also among the churches at large. Some will gain renown through ruling well for many years, while others will labor in relative obscurity and seclusion. By “job description” I refer to the specific proportion of time and energy given to various facets of ministerial labor. Some may labor almost exclusively in pastoral preaching and teaching. Others may devote all their labor to evangelism. Others may devote their energy to training men for the Christian ministry. Others may labor half in teaching ministerial students and half in pastoral preaching. The time spent in each sphere of ministerial labor may change over the years. It may vary with personal and domestic factors. We should decide these things by counsel and prayer, with a view to edification, maximum usefulness, stewardship of gift, and above all, the honor and glory of God. 6. Diversity implies that some are gifted to teach and preach who have not the office of elder. The propriety of lay preaching is implicit in diversity of gift. Some may have a gift to preach and yet, may, for some other reason, not be called to rule as an elder. These too may in an orderly manner exercise their gift among God’s people. Our Confession (26:11) also affirms this liberty, “Although it be incumbent on the bishops or pastors of the churches, to be instant in preaching the Word, by way of office, yet the work of preaching the Word is not so peculiarly confined to them, but that others also gifted and fitted by the Holy Spirit for it, and approved and called by the church, may and ought to perform it.” The Confession speaks of a church calling and approving men, who are not themselves elders, to the work of preaching the Word. Thus, our Baptist fathers take a moderate view. They avoid saying that only an ordained minister can ever do the work of preaching. They also avoid saying that a call to work in preaching is a personal matter in which the church has no voice. They even avoid conferring on lay preachers the elevated status of office in the church. They do not regard them as a separate class of church officers, who by divine right hold the office of “teacher”, or “doctor.” We too should not go to extremes. We should not build our polity of Christian leadership on our view of “teacher” in Eph. 4:11. What if Paul had said “pastor-preacher”, not “pastor-teacher”? Would that stand our polity on its ear? If so, we have built on the sand. Therefore, we must not think that training men for the ministry, or grounding the church in the faith, must be entrusted only to the “doctor.” These weighty tasks belong to the work of pastor-teachers as surely as preaching a sermon on Sunday. Yet, we must not overreact and insist that none but pastor-preachers can have any part whatsoever in the work of preaching. Churches may at times approve and commission men to ancillary labor in the Word as they see fit. That is their liberty. All things are yours, and you are Christ’s. 7. Diversity implies that all pastor preachers need not necessarily receive the same salary. 1 Tim. 5:17 also implies this. A new minister, fresh from seminary, should not expect to receive the same salary as a proficient veteran of Christ’s service with 20 years of sterling labor in the Word. This expectation would violate both nature’s law and Paul’s inspired polity for pastoral compensation. Conclusion: Here, some may say, is trouble in the making. All this diversity will provoke jealousy, ambition, greed, and division. It should come as no surprise that gospel ministers and other Christian workers struggle with these sins. Even the apostles were jealous for awhile of each other’s influence, for they argued over who was the greatest (Mark 9:34). The envy of religious leaders drove them to hate and crucify another religious leader with greater gifts and following. For centuries greed and ambition have prompted religious leaders to seek prize churches for themselves, with the largest congregation and the best financial package. For this cause the early church usually forbade ministers to transfer from one charge to another. Yes envy, jealousy, ambition, and greed are ever with us. Still, the Lord deposits a diversity of gifts in His church. Still we must honor this diversity. We must therefore mortify our envy until we truly rejoice in the influence of our more noted brethren. We must mortify our pride until we seek the help of our more gifted brethren. We must mortify our carnal ambition until we are content with whatever place Christ gives us in His vineyard. We must mortify our greed until we can thank God that our brother’s larger flock treats him with such exceeding generosity, while we struggle to make ends meet year after year in a less affluent and smaller charge. Laboring together with a diversity of gifts requires humility and grace. Without these virtues we will not profit from the ministry of the brother chosen over us to be chief speaker, or chosen instead of us to speak at the ministerium or conference. Rather, we will pick his message and manner to shreds. Without these virtues we will not help the brother appointed to be chairman rather than us, but will criticize his every move. Though much grace is required, yet through Christ we can do all things. May God grant us that grace to honor all his good gifts to His people. We come now full circle to where we began. Parity and diversity should mark our eldership. Only by God’s grace can we thus honor Him. Concern for God’s glory in His house must burn in our hearts. He can do exceeding abundantly over and above all we could ask or think. May it be so, and to God be all praise, credit, and glory (Eph. 3:20,21). This entry was posted in 1689, Parity of Elders, Reformed Baptist, Uncategorized and tagged Biblical Concept of parity, Parity of Elders, Reformed Baptist. Can We Please Stop Playing These Games? 1689 Federalism I’ve been looking for something like this for over a decade! Covenant Baptist Theological Seminary Great place for a solid Biblical education.